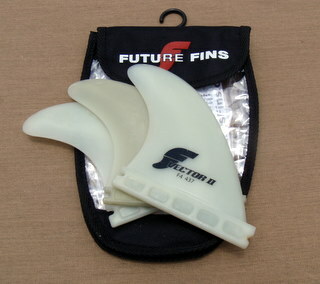 Some of my favorite fins to put on my boards back home in California are the Vector II FSG Fins by Future Fins. 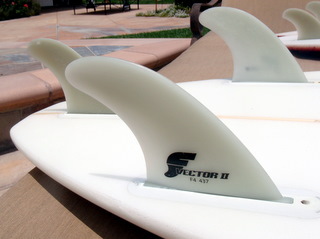 They are simple fins, and don’t look like anything special, but they work great in the California surf. These specific models are designed for lightweight surfers to use in mushy to rippable surf. Although I wish we had some more hollow waves in California more often, the fact is, we don’t. Because of this I have found these fins to be really good for places like Trestles, where the wave is slow, but really rippable. I find these fins are easier to break free while trying to throw some tail compared to the stock fins that come with most boards. They were a nice upgrade for me, making surfing in California a bit more fun. The only embarrassing thing is the description on their website saying they allow “groms and girls to throw the tail”…and I don’t fit into either of those categories, but I guess size-wise, I kind of do.